TGT is emerging as a leader among app-and-mortar retailers. In 2014, its Cartwheel app – which provides search, browse, and scan features with coupon-savings delivered at checkout – accounted for over three-quarters of online browsing and shopping at Target (with Target.com representing the balance) versus nearer one-quarter for WMT, M, and SHLD; in the case of WMT, this proportion to 70% in the 2015 holiday season. The shift from fixed to mobile internet is significant because, as comScore notes, “people will gravitate to eBay and Amazon apps if others don’t have good ones”. Of course, the time spent on Cartwheel does not mean customers are buying things. While TGT claims its app-customers spend nearly one-third more per store visit than others, digital sales have accounted for only 2.8% of TGT’s total sales for the first nine month of 2015 (although growth in digital sales has accounted for nearly 30% of the YTD growth in comparable store sales – +2.2% total increase in comparable store sales and +0.6% contribution from digital for the first nine months of ’15). In the short-run, the absence of mobile checkout may not matter given mobile-influenced sales will likely be double total e-commerce sales by 2018. In the longer-run, the retailer payments consortium, MCX, is creating a powerful value proposition – around the integration of payment, loyalty, coupons, and credit for returned items – in its CurrentC checkout capability. MCX COO Scott Rankin emphasizes the value of this integration when he comments that “payments-only [mobile] applications have met with limited success … it is the integration of payments with value-added services [such as loyalty] that makes CurrentC work” and consultant Richard Crone emphasizes that retailer apps are as much about marketing as payment: “if retailers can get people to use the wallet to put payments in, they can precede payments with ads and offers and they can follow payments with ads and offers with a high degree of relevancy that you do not get in today’s advertising”. The marketing power of mobile, versus fixed, internet to influence sales derives from the fact that smartphones and tablets offer the opportunity for real-time engagement and contextual relevance. Forrester/Tapad reports that nearly one-quarter of consumers expect ads to be tailored to their location and TGT reports that the personalization of Cartwheel coupons has increased the number of downloaded offers by 10% – the ability to deliver personalized, one-to-one communication through the purchase cycle is key to engendering brand relevance (and, ultimately, loyalty) rather than notification fatigue. The key to this personalization is combining this personally identifying information or PII with item-level (a.k.a. SKU-level) transaction data. Identifying customers is standard practice online but not in-store; as Scott Rankin notes, “mobile provides merchants with the opportunity to convert consumers from being anonymous to being named”. Indeed, to compete with Amazon by combining the immediacy of a store experience with the convenience of a digital experience and to improve the efficiency of shopper rewards from trade-spend (which, at $200bn/year in the US is meaningfully higher than US$60bn of bank interchange), a core priority of retailers is to obtain the identity of shoppers either through the “app-and-mortar” strategies (where shoppers use a retailer-branded app while in-store) or through partnership with the provider of the payment account (whether PYPL or a bank) that, after authenticating the customer, authorizes the transaction. Successful personalization is a matter of information scale: the more relevant data you have on a customer the greater the statistical likelihood of message relevance. Beyond the obvious logistical advantages of a store network, this information scale is the key reason that mobile can support app-n-mortar strategies to gain share over digital-only retailers: 90% of retail sales occur in-store representing a treasure trove of in-store purchase data that are inaccessible to the digital brands and, now that the Visa and MasterCard token services hide the identity of the customer from digital wallet-enablers such as Android Pay, likely to remain so. It is our view that the integrated (physical plus digital) shopping experience that is being built at TGT is likely to position the company for long-term market share gains. The associated momentum in comparable store increases should allow for the company to enjoy SG&A leverage. Even with ongoing pressure from incremental investments in ecommerce and other initiatives (grocery, for example), the company’s plan (announced earlier in 2015) to take $2 billion of costs (25% in cost of goods sold, the balance in SG&A) out of the income statement in ’15 and ’16 (primarily) should allow for some operating margin expansion (perhaps 20 – 30 bps) as we move into 2016. We see the downside risk in the name as being toward the mid – $60’s (3.6% yield) and the long-term upside reflecting a retailer that compounds earnings at FCF at 7-9% annually. Bear in mind, this was an $85 stock only several months ago, and while it may have been ahead of itself, we believe the opportunity set for investors over the next 12-18 months includes a return to that level. We believe that the key to TGT’s long term success is the company’s channel agnosticism (indifference as to where a sales takes place) and its focus on leveraging the synergies that exist between physical and digital assets in a combined effort to create what we have dubbed an “immersive brand experience” and what TGT calls being “guest obsessed”. It is our view that the customer shift to mobile phones will transform retailing by enabling “app-n-mortar” strategies where merchants, such as TGT, combine the convenience of a digital shopping experience with the immediacy of a store experience. “Online there have been a lot of innovations using technology and data to give you a personalized, relevant experience that makes it easy for you to find the products you are looking for or even the products you are not looking for … we were not able to bring those disruptions into the store because a customer did not carry a laptop … but now we have the opportunity to transform the [in-store] experience and create a personalized shopping assistant for them using their smartphones”. Gibu Thomas, senior VP of Mobile and Digital, WMT. WMT estimates that mobile-influenced offline sales, so where an app has been part of the shopping journey even if it is not used for payment, will amount to $700 billion by 2018 which is approximately double the current level of e-commerce sales. While we have written extensively about the value of a store network for distribution (including, for example, “click-and-collect” at TGT, where the company has suggested that between 10% and 15% of its digital orders are picked up in store) and for branding (including at Warby Parker, for example), the most important change is likely to involve data. Traditionally, unlike their online competitors, brick-n-mortar stores have not collected the identity of the customer at the time of transaction and so have not had the same ability to personalize the shopping experience and to deliver targeted marketing. This has been a decisive disadvantage for the traditional brick and mortar retailers. Mobile represents a deep shift in this dynamic since customers who use a retailer’s app typically are giving up their identity just as they do when they log-on to Amazon.com, for example. It is this that has shifted the retailer perspective from a concern around “showrooming” to a desire to encourage consumers to use smartphones in-store (so that, for example, TGT Wi-Fi-enabled its stores as early as 2011). In fact, showrooming has gone from a concern of traditional retailers to a deliberate initiative that, along with fulfillment, represents a capability that leverages the store base and adds value to consumers in a way that online only retailers can’t. For the first time, mobile traffic exceeded desktop traffic on Black Friday accounting for 57% of traffic according to IBM (versus 42% in 2014) while mobile sales were 36% of online sales (versus 30% in 2014). The gap between traffic and sales reflects the continued awkwardness of mobile checkout which will fade as mobile checkout buttons (e.g. PayPal Touch and Visa Checkout) gain adoption and as the retailer payments consortium, MCX, launches its CurrentC app nationally in 2016. Initial data suggest over three-quarters of mobile orders were on iOS devices with just under one-quarter on Android devices. The “carrot” of mobile shopping varies by retailer so, for example, Target’s Cartwheel app (more below) has attracted 20 million authenticated users through digital savings. The Scan-It app of Ahold’s Stop & Shop enables faster checkout along with couponing. Digital couponing is not aligned with every-day-low-pricing at WMT whose app is therefore focused on reinforcing the brand-promise of by recommending brand-switches to a shopper to lower the basket-cost and by providing in-store navigation. In all cases, the data-generated from the app is key: TGT links the data to a personalization engine for Cartwheel offers and reported in August that this drove a 10% increase in the number of offers downloaded by user. Capturing the data from offline sales is transformational since approximately 90% of commerce still occurs offline. The company is also testing something called REDperks – a mobile, non-tender based rewards app geared toward attracting guests that, for whatever reason, don’t want another debit or credit card. TGT has been clear that it wants an alternative to the tender-based REDcards for loyalty because “some consumers just do not want tender to be the thing that ties them to a store”. We believe that over time loyalty-and-payments will become more integrated into “pay-and-save” programs. Tender-enabling a retailer app, by adding a “pay-with-CurrentC” button to Cartwheel for example, creates a convenience benefit to the consumer since the pre-shopping activities (such as creating a list), in-store activities (such as running price-checks), checkout (including loyalty management and coupon-redemption in addition to payment), and post-shopping activities (such as obtaining a credit on a returned item) can be digitally-integrated. For example, WMT’s Savings Catcher program (providing a price-match guarantee to any local competitor’s printed ad price) requires consumers to scan a receipt barcode or enter a receipt number into the Walmart app. Automating this through integrating a payments capability into the app would surely increase usage beyond the current 3% of receipts. Indeed simplifying checkout (rather than just beating the card swipe) is a core objective for CurrentC by integrating payment, loyalty management, and coupon redemption into a single phone-enabled barcode scan action rather than three distinct plastic/paper processes. However, this tender-enablement will be a consumer choice rather than a requirement given that tying loyalty to tender can limit the reach of the loyalty program. 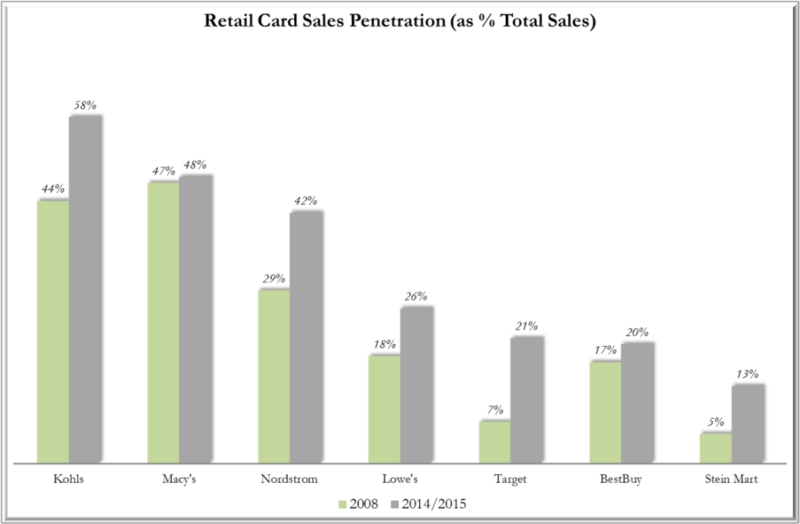 At TGT, for example, REDcard penetration of sales is just over 20% (and growing) and it is not surprising that the firm wants to broaden its loyalty program beyond this through a non-tender based option. Nonetheless, though, once a consumer is enrolled in a retailer loyalty app, the retailer has greater ability to steer towards proprietary tender so that we expect the tender-shift towards retail card sales to accelerate. In the specific case of TGT, for example, we expect a non-tender based loyalty program through Cartwheel to provide increasingly personalized offers and a separate tender-based rewards for those who choose to pay with CurrentC and use the Target RED card, rather than say Chase Visa, for fulfilment. Ultimately, the goal is more holistic approach to loyalty that allows for analysis of guest shopping tendencies and the personalization of not only rewards or loyalty offers, but the total shopping experience. TGT recognizes this, to the point where the company has recently replaced a third-party recommendation engine with an internally-developed product which incorporates both in-store and online guest history. One pushback that we receive with respect to our “app and mortar” thesis is app clutter – so many apps, so little time. Beacon technology, in our view, will be the change that allows a retailer (and consumer) to cut through the clutter, ideally “beaming” a relevant, personalized piece of information to the consumer based upon location, ideally fulfilling a need even before the consumer had given it a thought. As of August, the TGT is testing beacon technology in 50 stores across the country. The guest has to opt-in in via their Target app in order to receive notifications, which at this point appear to be advertisements based upon a guest’s location with a store. This falls well short of the potential of beacon technology as we see, which is provide content that is linked to the guests’ purchasing history, thereby engaging that guest more directly based on location. It is our view that the integrated (physical plus digital) shopping experience that is being built at TGT is likely to position the company for long-term market share gains. 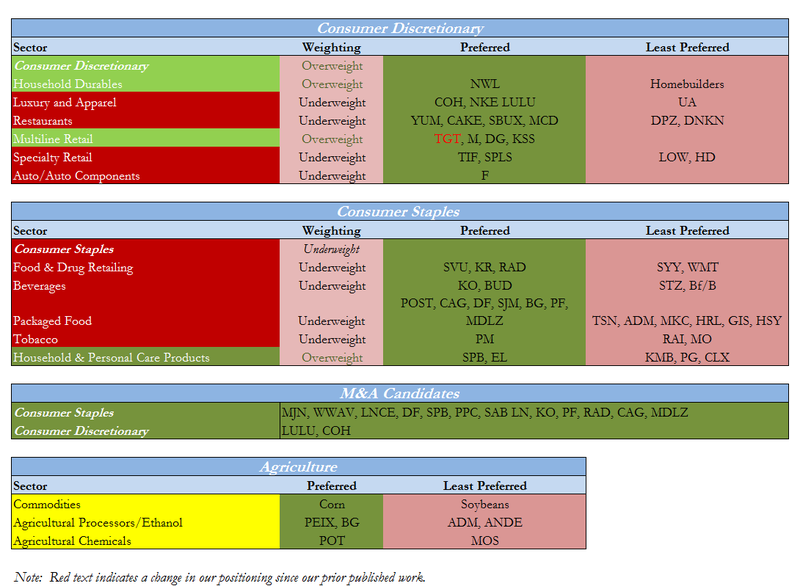 The associated momentum in comparable store increases should allow for the company to enjoy some SG&A leverage. Even with ongoing pressure from incremental investments in ecommerce and other initiatives (grocery, for example), the company’s plan (announced earlier in 2015) to take $2 billion of costs (25% in cost of goods sold, the balance in SG&A) out of the income statement in ’15 and ’16 (primarily) should allow for some operating margin expansion (perhaps 20 – 30 bps) as we move into 2016. There are, of course, some margin pressures that the company will need to deal with – aside from ongoing investments in ecommerce, the company will need to continue to make investments in terms of product quality and presentation, as well as investments in people (wage pressure). Considering all these factors, we believe that TGT can grow EPS in the 7-9% range in ’16 (bear in mind that shares repurchased in 2015 will support that number). 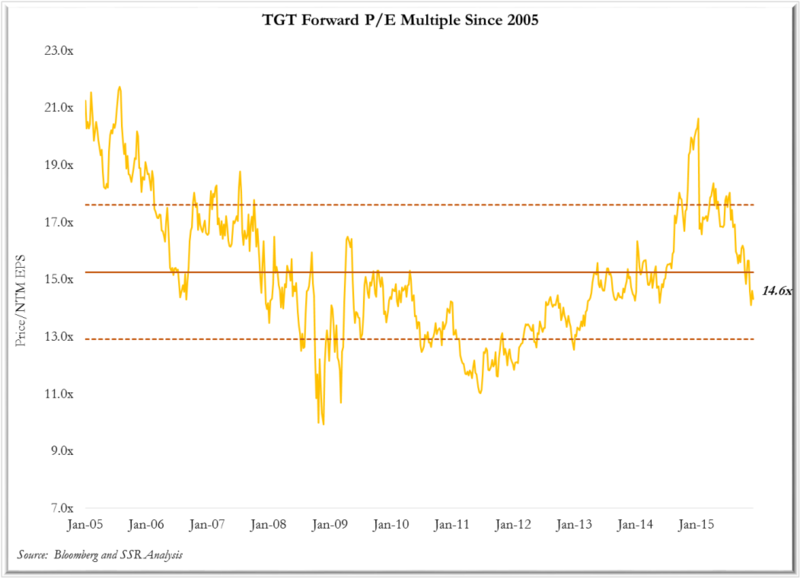 We see the company’s forward P/E (NTM EPS) multiple (~14.5x) as reasonable within the context of its history, as well as versus its peers (Walmart’s – WMT – valuation metrics are broadly in line with TGT’s, and we believe that TGT is a smaller ship to turn around and is moving nicely down the path to consistent growth) and relative to its growth opportunities. 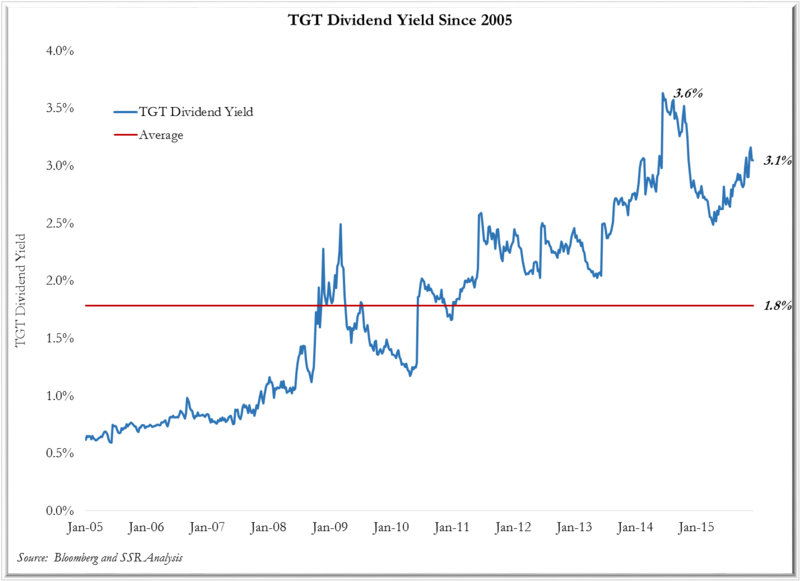 The company’s EV/EBITDA (’16 consensus) is an undemanding 7.4x and investors are have some reasonable support via the company’s 3.1% dividend yield – well above the average yield of the past ten years (1.8%) and near the all-time high of 3.6%. As explained below, we see the opportunity for sustained increases in the corporate dividend given the company’s free cash flow and balance sheet strength. The company has a robust free cash flow profile (nearly $3.00 per share through the first nine months of ’15) which should allow for the dividend to track higher over time. The company’s $0.56 quarterly ($2.24 annually) dividend (increased nearly 8% back in June) represents a payout ratio on adjusted EPS of less than 50%. At the same time in June, the company increased its share repurchase authorization to $10 billion from $5 billion – a number that compares favorably with TGT’s total market capitalization of ~$45 billion. The balance sheet is excellent, with the company operating at ~1.5x debt/EBITDA (2015, one quarter remaining), allowing for a potentially more aggressive share repurchase profile should management so elect.